Press the mode switch to adjust 8 lighting modes: Combination/In weave/Sequential/Slo glo/Chasing flash/Slow fade/Twinkle flash/Steady on. Let's admit it, solar powered rope lights often do not work or worked for only a short time before they fail, so why not opt for more reliable battery powered rope lights which is also portable and can last for quite a while. Battery case is IP44 waterproof with rubber ring in, durable, with a control button to easily switch lighting mode trip that is guaranteed to add fun to your advanture. * 1 x 120 LEDs Rope Light. * 1 x Battery Case. 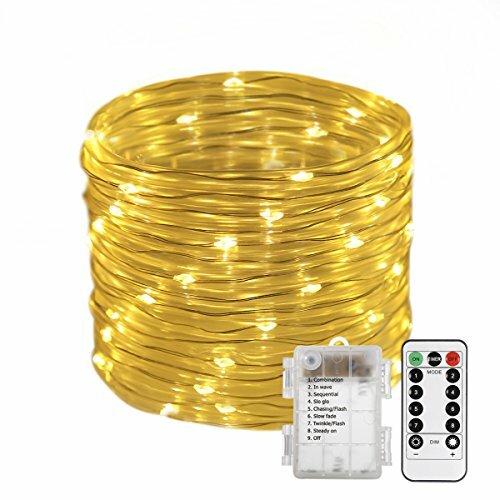 Battery Powered Rope String Light: 120 LED rope light is 46ft length(6.6ft lead cable included). Powered by 3AA battery (Not included). Flexible rope lights can be easily formed into any shape. A Remote Changes Everything: Control the lights with a 13-key remote controller(CR2025 coin battery included); dim/brighten the lights or set timers for 6 hours per day or switch to twinkle/slowfade/flash/strobe/steady on lighting mode with a click of a button. Timer Function for Long-lasting Decoration: With a timer button to set the lights on for 6 hours and off for 18 hours a day, troubel-free to make all your outdoor decorating festive and lively.